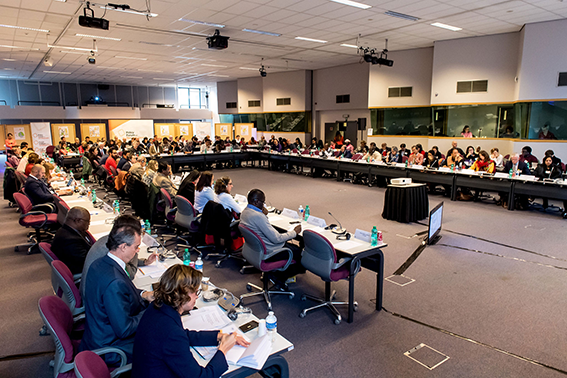 Between the 13th and the 15th of March 2019, the Global Policy Forum of Development by the European Commission was held in Brussels. This year’s meeting was looking as a milestone one: many new partners from Civil Society have joined the Frame Partnership Agreement, and the dynamic has raised a new level in the Dialogue between the EU and its partners. The 2019’s edition of the Global PFD has known significant participation: more than 130 representatives of civil society organizations (CSO), local authorities (LA), professional and business associations, EU Member States and EU institutions, to support, enhance, showcase and look for solutions around one world deliverable: the 2030 Agenda. From the Local Authorities side, CLGF, AIMF, Platforma and UCLG, with the regional sections such as UCLG-MEWA, UCLG ASPAC, FLACMA and UCLG Africa, were attending as well as the world secretariat, with the Secretary General, Emilia Saiz, acknowledging the road paved by both partners through this partnership, as well as recognizing the key role that this partnership and Dialogue with CSOs has played in sharing values at global level, principles and exchanging on common challenges, and the need for a specific Dialogue intra-governmental. An intense Dialogue between all participants highlighted the challenges that local democracy knows in some places of the world, and the role of Local Authorities when dealing with these challenges, as well as the solutions that are needed from the local level. In this regard, new EU instruments were shared, such as the Multiannual Financial Framework (MFF) and the proposal for a new Neighbourhood, Development and International Cooperation Instrument (NDICI).